On 22nd and 23rd May, Cardinal Vincent, accompanied by Independent Anti-Slavery Commissioner Kevin Hyland OBE and other members of the Santa Marta Group, visited the US to continue to raise awareness of the twin scourges of human trafficking and modern slavery around the world, and to encourage other nations and organisations to join the fight. During the three-day visit, they addressed a United Nations conference of diplomats, law enforcement officials and charities, stressing that trust is the key component in fighting human trafficking. They called for greater collaboration between government, law enforcement, civil society, the Church and other non-government organisations. ‘This is an evil crime on an international scale and, as a former commissioner for the Metropolitan Police said, it requires a concerted international response, and that is where the Church comes in. 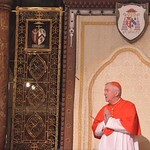 I couldn’t say that but that is what police chiefs see and it is the reason this Santa Marta partnership is growing and seeing results locally,’ said Cardinal Vincent of the role that the Church can play to bring together disparate groups. This focus on trusted relationships was at the heart of Sr Melissa Camardo’s address to the UN. She is one of the Religious women who run the Lifeway Network, an inspiring charity that rehabilitates victims in a similar way to the work of Bakhita House in London. In the collaboration between police and the Church trust is also being built. For the necessary leadership and accountability this trust is essential. ‘We need to recognise that organised crime is precisely that: organised. We are not. We need to develop these relationships and ensure the best local response by effecting and developing the resources of the Church and police across the world,’ said the Cardinal. ‘Building trust takes time. It requires an honest assessment of failures as well as successes. Hearing police chiefs and Church leaders admit to failings demonstrates progress. We should not be afraid; we should have less fear about reputation,’ he added. President of the UN General Assembly Miroslav Lajcak met with the Santa Marta Group and praised their approach: ‘This is a surprising alliance but effective,’ he said. 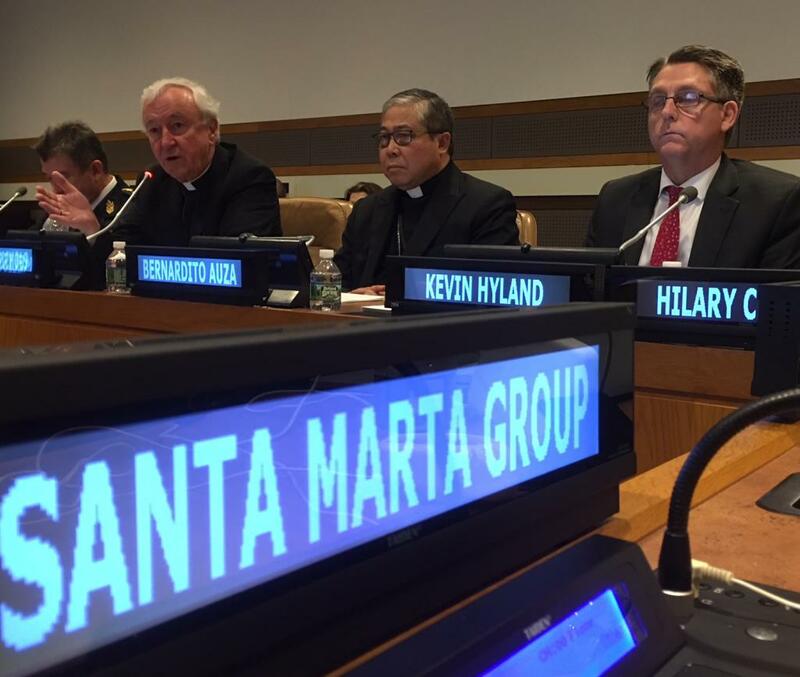 During their visit to New York, the Cardinal and Kevin Hyland also met with business leaders, emphasising the need to rehumanise business practices. This need to put ethics at the centre of their business should encompass both slavery-free supply chains and also examining their fundamental business purpose. The Santa Marta Group also met with Simone Monasebian, Director of the UN Office for Drugs and Crime which has lead responsibility on trafficking, as well as Assistant Secretary-General and victims’ rights advocate Jane Connors. In addition to encouraging coordinated action at the UN, Cardinal Vincent spent a morning with Religious women, Catholic charities and US Immigration and Customs officials (who take the law enforcement lead on combatting human trafficking) in New Jersey listening to their work on the ground. The visit ended with the Santa Marta Group receiving the UN’s Path to Peace Award at a ceremony in New York. The award recognises work that demonstrates commitment to the development of peace in the national and international arenas.